Front-runner Andres Manuel Lopez Obrador of the National Regeneration Movement gestures while addressing supporters during a campaign rally in Nuevo Laredo, Mexico, April 5, 2018. The front-runner in Mexico's presidential race on Thursday said U.S. President Donald Trump's plan to send National Guard troops to the border was a political ploy based on misinformation to gain support from his conservative base. The White House on Tuesday said mobilizing the National Guard was part of Trump's strategy to stop illegal immigrants from entering the country, whom he blames for crime and drug trafficking. "He's using all this campaign against Mexico as propaganda. That is the only way I can explain" the sending of U.S. military forces to the border, leftist Andres Manuel Lopez Obrador said during a campaign speech in the northern border city of Nuevo Laredo. "This great threat on the southern border of the United States that he says is there does not exist," said Lopez Obrador, who holds a double-digit lead in polls ahead of the July 1 presidential vote. Lopez Obrador said crime rates in U.S. border cities have been falling in recent years, as has the number of Mexicans seeking to cross the border. "This anti-Mexican policy has worked politically because unfortunately there are conservative sectors in the United States with little information and he knows how to awaken an anti-Mexican sentiment — what's called xenophobia, which can be like racism, hatred of foreigners," Lopez Obrador said. 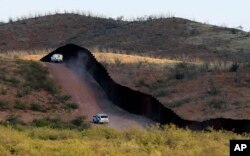 FILE - U.S. Border Patrol agents monitor the border fence in Naco, Ariz., Oct. 2, 2012. National Guard contingents in U.S. states that border Mexico say they are waiting for guidance from Washington to determine what they will do following President Donald Trump's April 4, 2018, proclamation directing deployment to fight illegal immigration and drug smuggling. Trump's comments this week directed at Mexico have thrust the countries' relationship into the center of Mexico's presidential campaign, where the ruling party is trailing. Mexico's Senate on Wednesday called on the government to end cooperation with the United States on migration and security over Trump's plans to deploy the National Guard along their shared border. Ricardo Anaya, the second-place candidate who heads a right-left coalition, backed the Senate motion at a news conference early Thursday. "You cannot negotiate or cooperate with threats," he said. "We must make it clear to President Trump that Mexico and the United States can continue to have a profitable relationship, of mutual benefit, or move into a confrontational relationship, where we all lose." Jose Antonio Meade, the candidate of the ruling Institutional Revolutionary Party, who ranks third in polls, on Wednesday urged candidates to stand together in denouncing the deployment of troops on the border. Independent candidate Margarita Zavala, in fourth place in recent polls, on Thursday called Trump's announcement a "historic error" that would hurt the United States as much as Mexico. "Is it reasonable for U.S. interests to block dialog with Mexico? The threat of militarizing the border ... is not an act of respect," she wrote in a letter to Trump. "I urge you to reconsider this hostile act."